Is tea grown in the United States? It sure is! Although we still have a way to go, American grown tea is a warm community and growing industry. From the rich volcanic soil of Hawai’i where the bulk of the farms reside to the rich and humid subtropical climate of the American Southeast to as far North as the Canadian border in the Pacific Northwest, tea farms have continued popping up all around the country. Now inhabiting 17 states, and with a single farm in Canada, we’ve put together a run-down of every tea farm we’ve been able to find so far. As more farms are established, we’ll update this article. The goal is to have a complete living catalog of American (and Canadian) tea growing regions. Did we miss something? Let us know in the comments. Also, if you get a chance, check out this interactive Google Map we made of all the farms listed below. Sometimes credited as the second-largest tea farm in America, Fairhope is operated by Donnie Barrett. This 40,000-plant strong tea garden was originally a Lipton Research Facility and was grown entirely from just three salvaged plants that were damaged during Hurricane Frederic and saved by Barrett from being burnt in a fire. Finished tea is available locally to buy. If you stop by, you can have a tour or join in one of their tea picking parties. You can reach Donnie through the Facebook for the Fairhope History Museum. Startup tea garden run by Bob Sims, father of Jonathan Sims, owner of Tea Embassy. Andalusia is not currently selling any tea. Run by Robert McArthur in Mobile, this small growing operation is just getting up and running, partially inspired by Donnie Barrett over at Fairhope Tea Plantation. McArthur has experimented with finished tea, but none to sell yet. Experimental tea farm owned and operated by Mike Fritts since 2010. He’s experimented with processing many styles of tea, apparently grown from descendants of tea planted in 1896 at the Wakamatsu Tea & Silk Colony. You can taste and buy his tea if you contact him or come to visit. Roy Fong, the founder of the groundbreaking Imperial Tea Court in San Francisco, has run a farm here since 2010 to experiment with the viability of growing tea. So far, no tea is available for purchase. Managed by James Orrock, who owns Single Origin Teas and comes from a citrus-growing family, attempts at a commercial tea farm have been made in Waverly since 2011, with a little initial help from Donnie Barrett of Fairhope Tea Plantation. Occasionally, tea is available for purchase through James’ website. Growing tea since 2011, the surrounding gardens are utilized in various ways for weddings, photo shoots, and performances. They currently produce lots of tea, available to buy locally, but are gearing up and experimenting to make a bigger push on the market. A division of Tsubaki Camellias, which also operates Gene’s Nursery in Savannah, Tsubaki has been family-owned for over 60 years. They sell all variety of Camellias, including many different cultivars of tea plants. They also provide extensive support and education for growing and raising your tea plants. Producing artisanal-quality tea since 2001 in their self-made Kilinoe Forest, all of their tea is hand-processed in small batches. They offer retail purchases of finished tea, tours of the garden, and occasional lessons on tea processing. The only established tea farm on Kauai’i, owned by Michelle Rose (with inspiration from Nigel Melican). They sell tea only locally, but process many different styles. Owned and operated by Bob Jacobson, this farm attempts to recreate the natural Hawaiian terroir as much as possible, while also retaining biodiversity and certified organic status. Their tea has won some awards at festivals as well. One of the farms, originally owned by Fang Sen Woo, working with Tea Hawaii & Company, producing a finished green tea. He is since retired, so it’s no clear if the farm is still there or not. Perhaps the oldest tea farm in Hawaii, founded in 1993 on an old sugarcane farm and operated by John Cross, who now works with Tea Hawaii & Company. A nine-acre farm bought in 2008 that raises livestock and grows turmeric and tea. They sell a finished white tea in small amounts. Run by Luana Stauffer and her partner Chuck, this small tea garden has produced some much-appreciated teas locally, including a yellow tea, but none for commercial sales thus far. Certified organic tea farm run by Taka and Kimberly Ino with a good range of finished tea to buy from their website. They are very committed to good and ethical farming techniques, which you can read about on their website. If you visit, you can also tour their farm. Perhaps the only tea farm on Maui, they are run by the company Pono Infusions, which sells all kinds of herbal tea blends. They’ve submitted their teas for evaluation before, and plan to have their American grown tea ready for retail this year. A division of the University of Hawai’i at Manoa’s College of Tropical Agriculture and Human Resources, they grow all manner of plants and research all manner of topics, with a particular focus on tea growing and processing. They provide detailed seminars on growing, processing, and experiment with hybridization. Certified Organic tea farm founded by Mike Longo and Rob Nunally (a former daylily hybridizer) in 2003. They offer tea farm tours, educational classes, and finished tea selections from their diverse range of cultivars and custom hybrids. A small farm on the big island near the Puna Forest Reserve growing coffee, macadamia nuts, orchids, and tea. Run by Jim Chestnut and Edna Arakawa, it seems their tea is available to buy locally, or through Far West Tea Traders. Chiu Leong and Eva Lee own this tea garden, right at the base of the Kilauea Volcano. In addition to the tea they grow, they have partnered with three other island growers to collaborate and sell their teas under the banner of Tea Hawaii: Johhny’s Garden, Volcano Tea Garden, and Hilo Tea Garden. A small tea farm owned by Mike Riley working with Tea Hawaii & Company, crafting a finished oolong tea. A winery near the Mauna Kea Volcano opened in 1986, they began growing tea in 2005 for a tea-infused wine. Since then, they’ve planted more tea, some of it from the Mealani Research Station, and processed a host of different styles of tea, which they sell locally and through their website. A startup tea farm in Northern Idaho, owned by Josephie Dean Jackson, who previously ran East Texas Tea Company. Planted in 2015, the garden will be some years from production, but she’s imported seeds from Nepal and Georgia, and has plans to buy plants from other growers in the country. William Luer has been growing a small amount of tea in the New Orleans area since 2003, experimenting with different processing styles. Although he’s submitted his tea for grading before, it’s usually only enough for just himself, but it seems if you drop him a line he’ll have tea with you. See his comments below. A farm and boutique growing lavender, roses, and tea. They sell their other products online along with blended and imported teas, but it’s not clear if any of the teas they sell are their own yet. Small farm experimenting with growing tea, amongst other things. They currently important and blend tea under the label BLTeas. Organic and Biodynamic farm run by Angela Macke, specializing in many kinds of herbs and plants, including tea, which they’ve grown since 2005. They grow and process many styles of tea, which they blend with other herbs and spices which are also grown on their farm. We visited them not long ago! A larger tea farm, run by Colonel Jason McDonald, that does a great deal of experimenting with different tea styles, including steaming, kneading, rolling, and documents their experiments through their social media. They’re also working towards full organic certification. As of yet, no commercial sales of finished tea, but their tea has been submitted for competition and grading, winning top honors. Situated in J&D Blueberry Farm, they’ve undertaken a new venture to grow tea. They are playing with finished tea and hope to be able to sell it soon. A restaurant and teahouse run by a family with ancestors who grew tea in Zhejiang. It’s become a larger growing operation and they now sell their tea, both blended and pure, for sale in their shop and on their website. A tea garden run by Christine and David Parks since 2006, and sold through Camellia Forest Nursery, which specializes in “collector’s market” Camellias. They have a strong supply of different cultivars of tea plant for purchase and services to help teach you how to grow and process the tea, a service other tea gardens along the coast have benefited from. Although finished tea has been submitted for competition and grading, it doesn’t seem to be available for retail purchases. Minto Island Growers, a well-known family-owned local farm growing all manner of vegetables, started including tea in 1988 with help from John Vendeland. They now grow plenty of winter-hardy plants and host some open-house events and guided tours. Tea plants, raw tea, and finished tea are available for purchase here as well, but move quickly as they sell out rather quickly due to popular demand. Founded in 2008, this tea farm run by Steve Lorch has developed a cold-hardy tea plant and a USDA approved micro-factory. 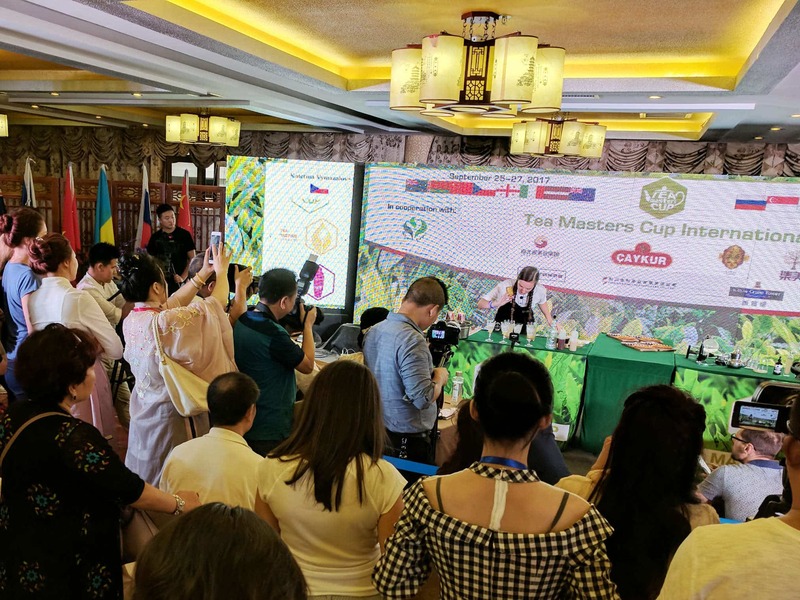 They are currently selling their tea (green and oolong), as well as co-packing/producing for other tea companies, and are gearing up to produce black tea and matcha in 2018. The farm is also expanding by 5 to 10,000 plants per year, so keep a lookout for more interesting options soon! Lorch is active in the American tea-growing community, sharing tips, tricks, and home-grown wisdom, as well as giving farm tours with those interested. He recently reported to me that he had the caffeine measured in his tea and it’s exceedingly high, on the level of Kenya grown assamica. Perhaps the largest American tea farm, and certainly the most historic, this 127-acre plantation was founded on plants grown by Dr. Charles Shepard in 1888 for his farm, the Pinehurst Tea Plantation, which was good enough to win top honors at the 1904 World’s Fair. After his death, the plants fell into disrepair but were later rediscovered and transplanted to their current location, where they became part of a Lipton research facility in 1963. Later, tea taster William Hall purchased the farm in 1987 and began farming the tea commercially. It’s now co-owned by him and the Bigelow family and provides tours, education, and plenty of tea to buy. Begun by Josephie Dean Jackson in 2009, who is currently working on getting a small tea farm up and running in Idaho, this farm in Texas was begun as a way of experimenting with growing tea and demoing it to others who’d like to grow tea, with inspiration from Donnie Barrett at Fairhope Tea Plantation. It’s now a private garden and doesn’t sell tea commercially. Owned by Unchon Ramos and her daughter Joanna, they’ve been growing small amounts of tea since 2012, for use entirely in kitchen and bath products such as a variety of tea-infused body soaps and shampoo available for purchase through their website. No finished tea for drinking is available for now. Over 85 years old, this family-owned farm specialized in growing berries, but has experimented with growing tea since 1997, with influence from John Vendeland. Machinery was bought from Taiwan to increase their processing quality and they now produce many different styles of tea. But it’s not always available for purchase, and after a worker’s union strike in 2016, it seems to be indefinitely suspended. Soon to be Westholme Tea Company, this dynamic tea farm has been growing tea since 2010 and has gallery space, tearoom, and an additional selection of imported teas. Finished tea in many different styles available to buy and to keep up with high demand, they’re adding more plants every year and undergoing a small re-branding in coming months. Any others you know of? Let us know! Also, be sure to visit the US League of Tea Growers and our recap of their first meeting. Have you seen the recent study done by consumer labs? They tested tea sold in local supermarkets and found extremely high levels of lead. Most of these tea leaves and herbs were grown in China. China just got rid of leaded gasoline in the year 2000 but their soil is saturated with lead. I don’t know which brands of tea to keep and which to throw out. This is why we recommend buying quality tea, not cheap supermarket stuff. Find a trusted tea supplier! Not all tea from China is contaminated, and they’ll be able to sell you good quality tea. Tony, please add Blue Dreams USA, a lavender, roses & tea farm. We are the first tea farm in Frederick County, Maryland. Please visit http://www.bluedreamsusa.com or http://www.facebook.com/BlueDreamsUSA. Thanks. Alabama Tea Company ! Syrene Alabama . Organic shade grown . Best Tea in Bama . Roll Tide ! Do they grow tea or just herbs? Both, I believe. The grow black, green, red, herbal, and floral. Check their website for their listing of products. Do you have a list of organic tea growers in the US? i am a degree holder in Tea Technology and Value Addition in University of Uva Wellassa in Sri lanka. I am happy to here about the news of Growing tea in USA. Thank you for this on USA grown teas. I wonder if you could take another step: are any of these growers using organic methods? I understand that tea is particularly toxic as to the amount of pesticides used in it’s production, and am looking for a US (not China or Japan) source to obtain my organic tea. Again, thanks for the research for me! Hi Carol, I would continue down that path to note organic or not organic, but I don’t know if that will get us anywhere. Your comment about tea being “particularly toxic” strikes me — tea is not particularly toxic. All tea sold in the United States must meet MRL (maximum residue level) requirements and are generally safe for consumption. China and Japan make some of the best teas in the world and organic practices are in use there in large amounts, you just have to find them. The Dose is the Poison: All things are poison and nothing (is) without poison; only the dose makes that a thing is no poison. This is the battle cry for most regulations in the US regarding acceptable does of a poison, but studies are proving this no longer holds true. Most incidences of cancer, thyroid problems and endocrine disruption are caused even at sub lethal levels, not to mention the ecological damage that is done to local systems. Organic and Biodynamic farmers are leading growth rates in all industries as the ever growing increase and demand for safe food and products grow. I hope your book will be an all inclusive look into the world of tea aficionado’s. Good luck and keep me posted! I LOVE all teas and look forward to learning more. Hi Tony: Things are doing fine here, I hope I get into your book for California growers. Thanks again for the tea time at David ‘s. PS Come on up and see things how they are. Tony: Golden Feather Tea is north and east of Roy Fong, in the Sierra Nevada foothills about 3 hrs. Some excellent growing grounds for Camellia Sinensis. If you like gold .you’ll like our tea. Planted in 2010. Do you sell your tea wholesale?…If so, can you send me a price list? Im in the process of setting up an online tea outlet and am in need of some suppliers. Hi – I am thinking about trying to grow tea – I live on a 30 acre agricultural property near Pescadero, California. I see you only have one tea farm in California. Is it not realistic to grow camellia sinensis here? Any suggestions how to get started if it is possible? Thank you! Enjoyed your blog, looking forward to your book!! First I think you’ll find that the tea “farm” in California has yet to produce any tea and, as far as I know, hasn’t successfully left the greenhouse yet. As far as I can tell, the main problem is soil acidity – much of California has alkaline soils and most of the ground and surface water is also alkaline (above 8 pH). This is a serious issue since you cannot rely on rainfall during the growing season in California, even if you have acid soils. Thus, to grow tea in California you’ll be constantly fighting high pH and if your soil has much clay in it, that will be a costly ordeal. In all likelihood a California grower would need vast quantities of acidifiers on a permanent, ongoing basis. Yet, Mr. Fong hasn’t given up, and he may very well finally succeed at producing tea in the ground out there…we’ll see. Dunaway Gardens in Newnan, Georgia currently has over an acre planted in tea with more on the way. Dunaway expects to be the first Certified Organic commercial tea operation in in North America! The farm plans to offer some tea blended with small amounts of its Georgia-grown stuff later this year, and should have its first commercial harvest next year, in 2015. Dunaway plans to pick its tea by hand and has plots both with shade trees and without, though it wants to eventually incorporate shade trees into most of its operation. The Dunaway Gardens website will be adding information about its tea fields and products later this year; I will let you know when it is up and running. Thanks! Can you let me know when your harvest is ready? Also, do you have a price list that I can see. I’d love to check out your stash! or taste. Do you know what they changed, and how I could get some of the good taste of years past. Thanks so much JoAnn, I added Hawaii Rainforest tea. There are so many in Hawaii now, I wish I knew all of them when I visited summer ’13. I have been growing tea in New Orleans, Louisiana, since 2003. I have a small tea garden consisting of 35 plants. I make white tea, green tea, oolong tea, and red (black) tea on a regular basis during the growing season. I call the tea 30/90 Tea based on the latitude and longitude of New Orleans. I am not a commercial farm. William, that’s awesome. Would you like me to add you to the list? Hey William, I am a fellow Louisiana native who is thinking about growing backyard tea. Is there any way I can get in touch with you to ask you about your growing techniques. I didn’t know that there is a green tea garden in Louisiana. I’m always thinking of green tea application to Louisiana Sugar Mills as a scientist. Someday I’d like to visit your small garden. Could I get your place address? Thanks for starting this list of tea farms in the US. It’s such a helpful resource! I knew that there were farms in Hawaii, but there are a lot more than I realized. I wish more of the growers had online tea shops or links to places where you can buy their tea online. But I guess they’re too busy farming. Here in Florida, the camilia sinensis grows very well, producing beautiful blooms. Just needs to be kept where it gets good drainage and not too much water. I find it interesting to see that most of the plantations are in Hawaii. I was wondering why this was the case until I read in Wikipedia that Mauna Kea was more than 4000 meters above sea level. Thanks for the great post! Elevation doesn’t make great tea as much as a subtropical climate. Wow. I had NO idea tea was grown in the US, but now that I think about it, that was kind of idiotic of me to assume it wasn’t. I’d be really curios to try some of the US grown teas to see how they stack up against the Asian ones. Also, don’t forget the Fairhope Tea Plantation in Fairhope, Alabama. I think it might also be useful to indicate which of these farms use clonally-propagated tea (rather than seedling-grown plants) as well as which ones hand-pick their tea as opposed to using machines. Also, I believe only 1-2 farms in Hawaii are growing their tea under any kind of shade…. Jeffrey, As far as I know the only plantation who uses machines to pick their tea is Charleston Tea Plantation. They are still using the massive combines cobbled together by Lipton 50 years ago. According to them they are the only tea harvester mowers/machines in the world. I believe this is the only way they are able to sell beyond locally and have gained the partnership with Bigelow tea. They are great people running the place and totally worth a visit if you have a chance. Also, their tea plants are clonally-propagated from the best tea plants. Amazing! We have to admit that we didn’t know anything about tea cultivation in the United States! We have seen some figures, but nothing serious and we have never thought that there are in fact so many tea farms out there. I guess the world will soon start to import tea from the United States also, not only from the Asian countries. Very useful article, thanks for sharing! Correction! 🙂 Sakuma Bro’s is in Washington state. woops! thanks for the correction. fixed it!